This Blog follows on from the previous post. 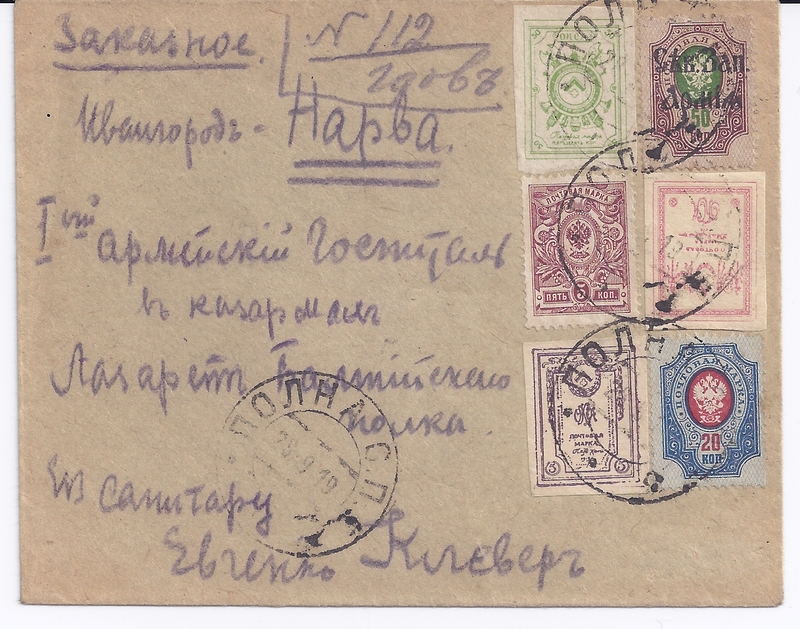 A photo of this cover was published in 1991 by Dr R J Ceresa in vol 3, Parts 19 / 21 of his The Postage Stamps of Russia 1917 - 1923 handbooks. He gives its provenance as the collection of a Herr Muller (not Müller - see Ivo Steijn's Comment below). Now it looks at least semi-philatelic but the important question (at this point) is whether it did go through the post. At the top is a Manuscript registration cachet "N 112 Gdov" in a different pencil and handwriting from that which produced the address. The address is an army hospital in Ivangorod - Narva and the addressee is named Klever and is identified as a hospital or medical orderly. The stamps are cancelled POLNA SPB 28 9 19 and we know (thanks to Alexander Epstein) that this canceller was in use at Gdov at this time. On the back is the name and address of the sender, another Klever, but in a different pencil and handwriting. It links the sender to the Northern Army.The letter has been roughly opened - but in such a way as to create in my mind the suspicion that there was nothing in the envelope. Most importantly, the cover has a new style Estonian cancellation for NARWA "a" 1 10 1919, perfectly genuine ... BUT not quite enough to rule out this possibility, that Klever carried this letter himself to Narva and got it backstamped there. There are no Registry markings which one could link to Narva. This cover has an Estonian censor triangle on the front and a LEIPZIG receiver on the reverse. This cover surely did go through the post, suggesting that the previous one did too - unless Klever carried them both to Narva. But if he had done that, even the most co-operative post office would probably have backstamped the Leipzig letter with a NARWA cancellation in order to indicate the transit. This cover also has Klever's pencilled address on the back but again in a different handwriting and pencil. 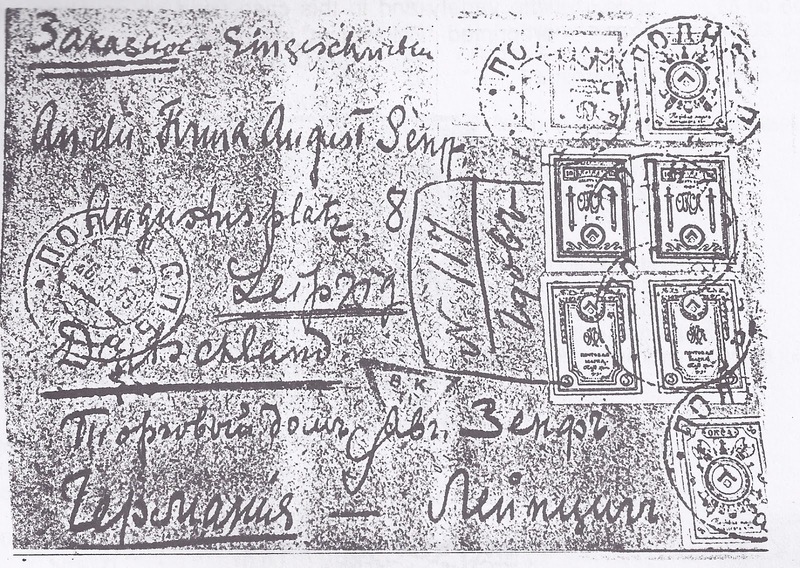 The fact that Klever was writing to Senf indicates a clear philatelic motivation, most likely informing them of the existence of this stamp issue. It is in fact good news for the authenticity of this issue that someone was doing this from the right place and at more or less the right time. It would be good to know who Klever was. 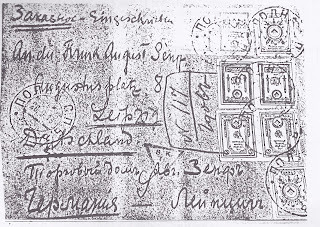 The point of this analysis, however, is to argue that the likelihood that the first cover travelled through the post to Narva is increased by the near-certainty that this second cover travelled through the post to Leipzig. What would really help the analysis along would be to have the covers in between Gdov 112 and 117 and on either side of those numbers. How many letters did Klever send on that day? Who else used the post office that day? I can't tell you who Kleber was but I do know who Wim Muller was: a Dutch collector of Baltic material, and owner of two really nice NWArmy/OKCA covers. I believe the other cover went to Leipzig. I have some personal scar tissue with this cover, as I was in a position to buy it when I first started out collecting Civil War material. It was then already in the stock of a dealer called Oosterink. I bought a really nice FER cover instead (starving student, etc). Since then I've stopped even thinking about the NWArmy because covers like this, with at least a strong case for legitimacy, are so scarce. I hope it will make some collector very happy.